In daring new novel Saving Jackie K, the clock ticks down as the tension mounts up, propelling the characters on a non-stop thrill-ride to an inescapable destination: Dealey Plaza in Dallas. 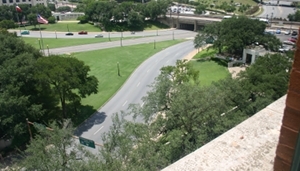 The site of JFK’s brutal assassination back in 1963, the park has remained virtually the same over the past fifty years. 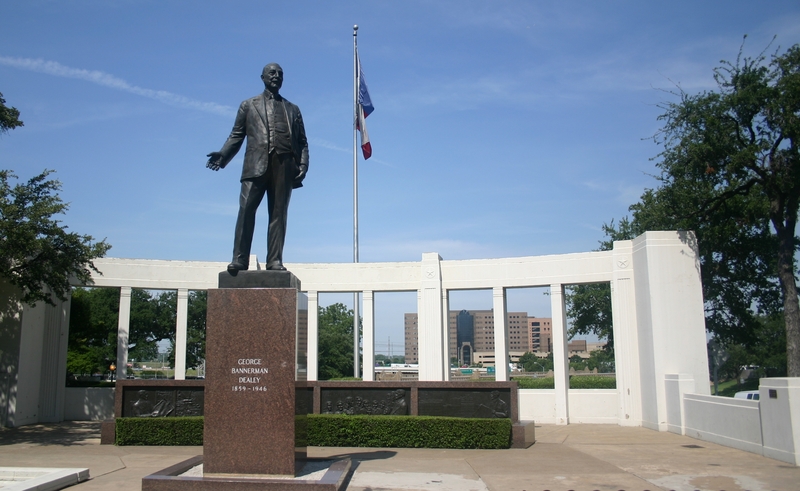 George Bannerman Dealey—longtime publisher of the Dallas Morning News—used his influence to campaign for redevelopment of the plaza, which had become neglected and run-down in the 1930s. His efforts inspired revitalization of the park, and as a result, it bears his name. A larger-than-life statue of the powerful business mogul in the plaza pays him homage. 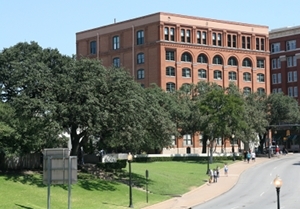 Dominating the park on the northwest corner of Elm and Houston Streets is the Texas School Book Depository Building, formerly with its fabled Hertz billboard and clock on the roof. The seven-story brick building was a regional textbook storage and redistribution center in 1963. Employee Lee Harvey Oswald allegedly fired his Mannlicher-Carcano rifle from the sixth-floor southeast window at the president’s motorcade. 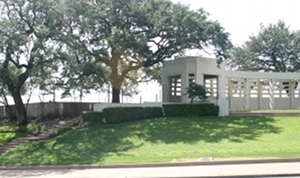 North of Elm Street is a concrete structure called the Pergola. About one hundred feet long, the rounded concrete trellis has a semi-enclosed back and top with a latticework of gaping rectangles. 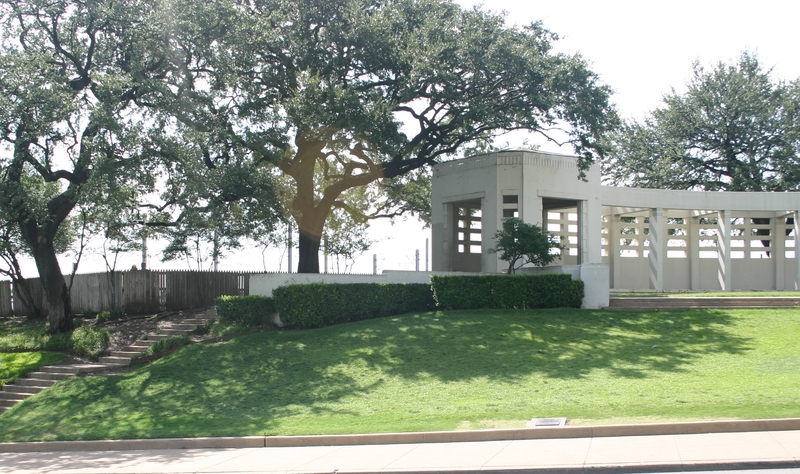 The Pergola sits atop a sloping hill known as the Grassy Knoll. 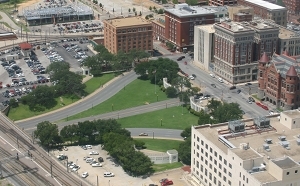 Many conspiracy experts theorize that shots were also fired from the Grassy Knoll or from behind the stockade fence. 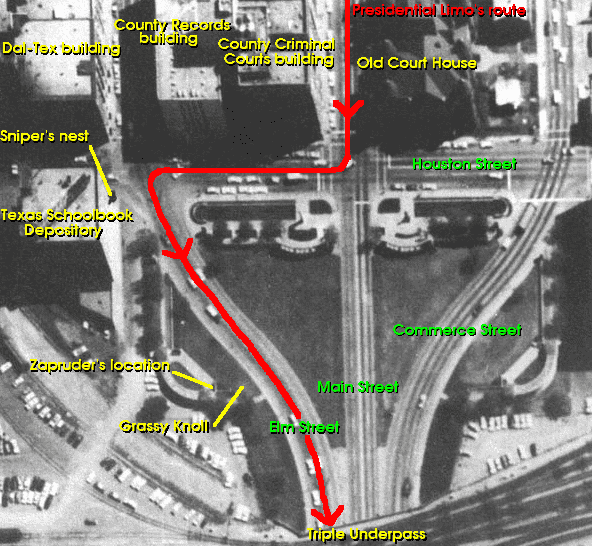 At 12:29 pm on November 22, 1963, President Kennedy’s motorcade made a sharp left onto Elm Street from Houston Street, entering Dealey Plaza. American and presidential flags billowed from the front quarter panels of his specially designed Lincoln convertible. As the spectators cheered, President and Mrs. Kennedy smiled and waved at the crowd. At 12:30 pm, shots rang out, echoing throughout the plaza. The motorcade sped away, transporting the fatally wounded president to Parkland Memorial Hospital. He was declared dead thirty minutes later.